Daniel Austin Dowling was born in New York City and was ordained a priest for the Diocese of Providence, Rhode Island in 1891. He was consecrated the first bishop for the newly erected Diocese of Des Moines in 1912 and remained there for seven years. Following the death of Archbishop Ireland, he was appointed as the second Archbishop of the Archdiocese of Saint Paul, and was installed on March 25th, 1919. Archbishop Dowling was a highly educated, intellectual man who built up and consolidated the educational system in the Archdiocese. In remembrance of his predecessor, Dowling undertook an ambitious plan in raising money for Catholic education. He established the Archbishop Ireland Education Fund, raising nearly 4.4 million dollars. One of more substantial institutions made possible by this fund was the preparatory seminary, Nazareth Hall, which he founded and built. Archbishop Dowling took a keen interest in college seminarian formation, and frequently visited the beautiful campus on the shores of Lake Johanna, which has since been reconfigured as Northwestern College. 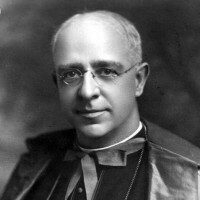 In addition to diocesan education reform, Archbishop Dowling also oversaw the founding of many diocesan works of charity, worked to advance the causes of lay men and women’s groups, including worker’s unions. Moreover, he also saw that the needs of rural Catholics were being met, as he formed the Rural Life Conference, and erected rural parishes and schools. During Archbishop Dowling’s tenure, Saint Mary’s in Minneapolis was elevated to become the first basilica in the United States, and the diocese celebrated its 75th anniversary. Other projects in which Dowling took part included the erection of the main Cathedral altar, the building of a new Chancery, as well as a Clergy residence for the Cathedral, all which still stand today. Archbishop Dowling died on November 29, 1930, due to a chronic heart condition. He is also buried at Calvary cemetery in Saint Paul.